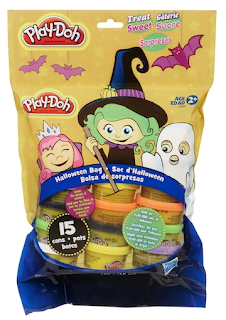 Kohls has the Hasbro Play-Doh Treat Without The Sweet Halloween Bag on sale for $4.49 (regularly $4.99). Once you add this item to your cart you will get an extra 15% off making the final cost just $3.81. This item is not eligible for promotional offers and coupons, but you are able to earn and redeem Kohl’s Cash and YES2YOU Rewards. If you are a Kohl’s cardholder try entering promo code MVCFREEOCT for possible free shipping.